The release of Ubuntu Dapper 6.06 caused a lot of buzz even before it happened. The actual release was originally planned for April 2006 and if it wasn’t postponed for June 1st it would have been called 6.04 according to its version naming scheme (6 for the current year and 04 for month). Mark Shuttleworth’s request for postponing, the consequential decision making process (which was open), but also some friction regarding the kubuntu project management only contributed to the already quite high awareness, or “buzz”, around this popular GNU/Linux distribution. So, what’s it all about? What does this GNU/Linux distribution really deliver? This review is about that new Ubuntu experience. Ubuntu Dapper installation CD doubles as a live CD which allows you to try Ubuntu before you have actually installed it on your hard drive. It is basically set up almost exactly the same as the default Ubuntu install. The only visible difference is that livecd contains a couple of icons on the desktop and the default install doesn’t. The icons are the “examples” folder shortcut and the “install” shortcut (which launches the installation program). I have no doubts that a curious user will want to click on that “examples” folder to see what’s in it. 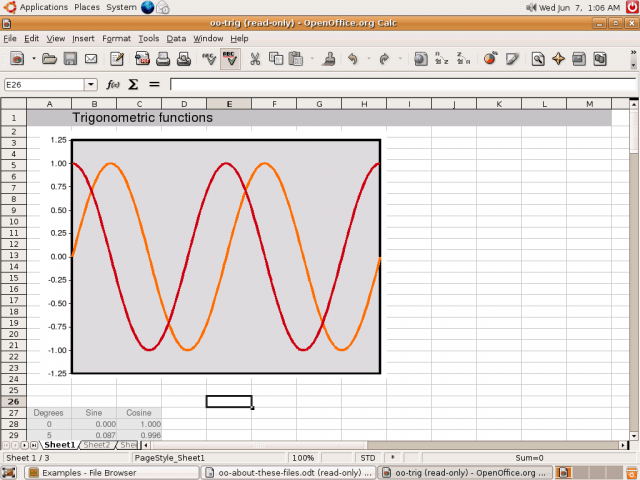 The content of the examples folder is the whole slew of files of various file formats, from an ogg video to the OpenOffice.org spreadsheets. I assume that the intended purpose of this is to showcase what can be created with Ubuntu. Since every file launches an appropriate program with which it should be opened and displays some pretty nice examples of work, I think this is indeed a good way to send a positive signal to the user: “yes, you can do these jobs with this GNU/Linux operating system”. I imagine it may be a comforting message to many new users. 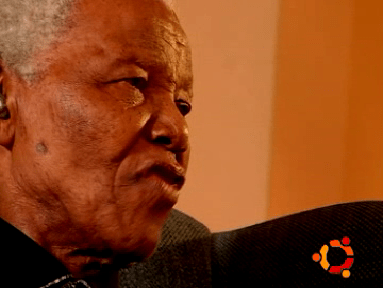 One interesting thing I’ve found among these example files is the ogg video, which is a quiet inspirational movie featuring an interview with Nelson Mandela, the former president of South Africa (homeland of Mark Shuttleworth, the founder of Ubuntu). The video gives you that warm and fuzzy feeling about Ubuntu, as if you are becoming part of something bigger and better. If you are coming from Windows, you in fact do, but that’s another story. Suffice it to say that this video is a powerful way to get new users intrigued and a nice push to get people interested in going through with the install of Ubuntu to their hard drives. Besides all the interesting stuff available in the examples folder, this Ubuntu CD makes it possible for you to get connected to the net and surf the web, chat with friends using gaim, or even do some work yourself that you can then save onto a removable media that you may posses. Even if you never intended to install Ubuntu on a particular machine where you booted this CD it can be very useful. I have spent around an hour playing with it (made some shots, surfed some sites and sent few IRC messages to our channel) and I haven’t encountered any problems. I think this double purpose is generally a good thing, as it saves you time you’d have to spend downloading and burning a second CD should you decide to install it. There are also situations where it could be immensely valuable such as when you show it off to a friend and he decides he wants to install it on his computer – all you have to do is launch an installation program that is right there on the desktop. The new Ubuntu installation program is probably one of if not the easiest around. It is graphical, unlike in previous versions of Ubuntu, and has just six steps that user has to go through to complete the installation, of which most are pretty much no brainers. 2) Tell the installer where you are: select your city and time zone. A nice zoom able map is provided where you can select your area and city. The “set time” button also allows you to adjust your time and date if necessary. 3) Select your keyboard layout. You can select one that most closely matches your keyboard and test it out in a box below. 5) Where to install / partitioning: This step can be one of the easiest or the hardest, depending on your requirements. 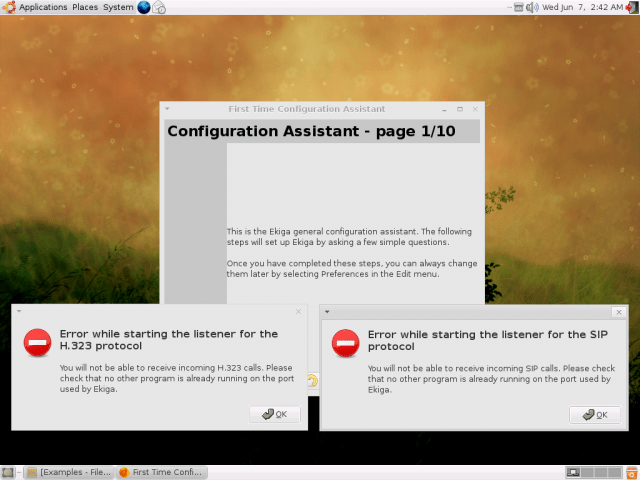 It allows you to instruct the installer where exactly is it to install Ubuntu. You ultimately have three options as shown below: (1) Erase entire disk, (2) Use largest continuous free space or (3) manually edit your partition table. The first two steps are the easiest as by choosing them you basically let the installer do everything for you. One of the first two steps are recommended for the new user who hasn’t ever installed a GNU/Linux or even any other operating system. 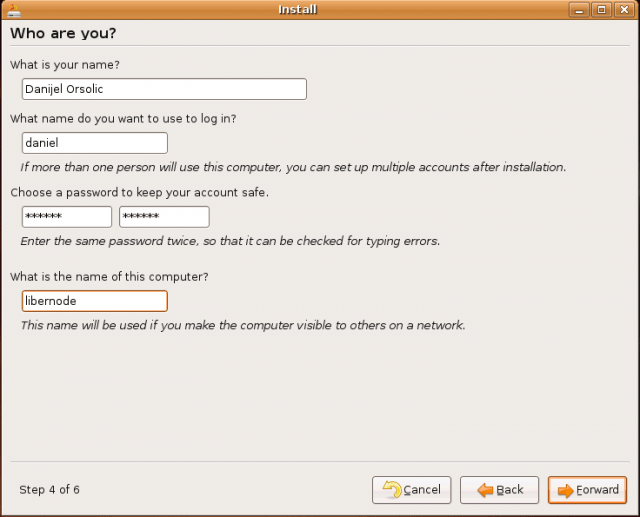 If you are installing it onto a new machine that is to be running only Ubuntu, then the first option makes most sense. If you already have something on your disk, but also have some free unpartitioned space, the second option is probably the best. Only if neither of the above is correct or if you simply want to have full control over how should the disk be partitioned, choose the third option. – 5.1) In case you have chosen the third option, to manually partition your hard disk, you will be greeted with a partitioning program with a graphical representation of your entire disk. You create new partitions by clicking on the empty space and clicking the “new” button. As you finish creating new partitions they are shown as jobs that the partitioner needs to do allowing you to edit or delete any of these jobs if you decide to make modifications. The screenshots below show how it looks like and are pretty self explanatory. I think that this partitioning program is definitely on par with some of the other user friendly partitioning programs such as notably one of Mandriva. I really don’t know how much better can it get than this, especially considering that many users wont even need to see the partitioning program if they just choose one of the first two options described above. – 5.2) After you have created the necessary partitions you have to assign mount points to them. The Ubuntu installer allows you to do it in a farily efficient way, displaying selectable (as well as manually customizable) mount point locations on the left, and the drop down menus of existing partitions on the right, along with their size. The tick boxes on the far right allow you to select whether to reformat a given partition or not. One possibly annoying miss that I found here is that if you select to reformat a partition at this screen, it wont give you options as to which file system you want for it, and will just make it ext3. This probably wont bother most users though, especially those coming from Windows or Mac OS X. You can have a partition with a different file system type though, if you create empty partitions of those types in a previous step and don’t choose to reformat them here. 6) Summary: Step six requires you to do nothing but read the summary of settings you have chosen in previous five steps and choose whether to accept these settings and go with the install or go back and make modifications. And then it goes on with the install. Installation is definitely not the fastest around and I believe this one took more time than the previous versions of Ubuntu, but this is probably something we can let through considering the big improvements to the installation interface and the user friendliness of the whole process. One thing that was apparently sacrificed for that goal is the bootloader setup which is missing in this installer. The installation will simply install GRUB with the default set of Ubuntu boot options. I have an Arch GNU/Linux on my other partitions and it didn’t even detect that. In this regard, it is actually a step back from previous releases where other GNU/Linux distributions, as well as operating systems such as Windows, were properly detected and added to the bootloader. Now there is not even an option to add them yourself, short of editing the GRUB configuration manually after installation. 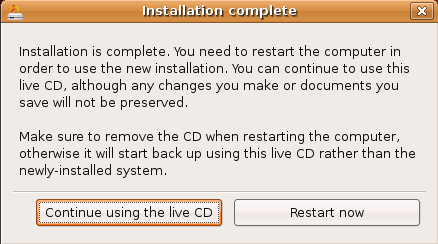 Once installation is complete you are presented with a dialog that allows you to reboot or choose to continue using the livecd. This nicely adds up to the double purpose of this CD. All things considered, this is definitely one of the most user friendly installations in the GNU/Linux world so far, even though it sacrifices a few options to provide that experience, from the missing bootloader configuration (as described above) to the lack of ability to custom select packages for installation. It however clearly shows that Ubuntu is aimed at new desktop GNU/Linux users coming from Windows or Mac OS X and expecting everything to be easy and smooth, without asking too many questions and requiring too much to do. Installing Ubuntu is thus probably easier than installing Windows XP (at least if you choose not to customize the partition table). There is no doubt anymore that when it comes to installing GNU/Linux, it not only measures up to Windows, but beats it too. As expected, the first boot up of the new Ubuntu system went quite well. While it is not as fast as with some GNU/Linux distros, most users to whom Ubuntu is targeted probably wont mind, and it is definitely not slower than the Windows XP boot so former Windows users probably wont miss much in this regard. The boot screen is nice looking and boot messages were made friendlier than the flying console text would be. After the boot, we are presented with the great looking GDM (GNOME Desktop Manager) screen asking to enter username and then password, upon which the Ubuntu desktop starts loading with the golden looking splash. Few moments later we see an Ubuntu desktop and can start playing with it. One of the greatest strengths of Ubuntu was always its applications selection. Instead of offering quantity it opts for offering a quality choice for every basic task a desktop user may want to do with his computer. Menus are logically divided into accessories, games, graphics, internet, office and sound & video. Some of the notable applications included are GIMP image editor, gThumb image viewer, Ekiga Softphone (VoIP, IP-Telephony and Videoconferencing application), Totem movie player, Rythmbox music player, Serpentine audio CD creator, SoundJuicer CD ripper and of course Evolution email client, GAIM IM client, latest Firefox web browser and the whole OpenOffice.org suite. Menus however don’t reveal the whole offering, but there is an “Alacarte Menu Editor” in accessories which allows you to easily add, remove or move your menu items. Menus and menu items that are available, but aren’t currently active are marked with a smaller font, as shown on the screenshot below where bittorrent is also available, but hidden. All it takes to activate a menu item is to check a tick box next to it. 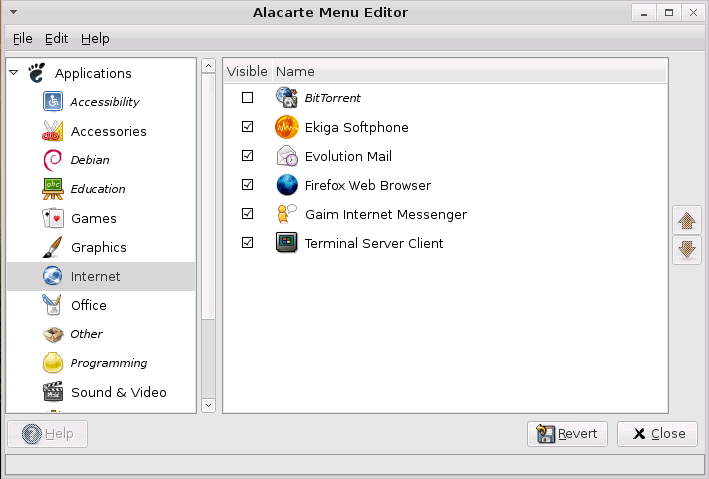 The file menu of the Alacarte Menu Editor allows you to add a new menu or a new menu entry. All applications seem to be set up to work out of the box. However, the Ekiga Softphone does experience some problems as shown below. Users that have expected this to work out of the box may find it a bit discomforting. Configuring Ubuntu should be fairly easy as pretty much all possible configuration options have their own special dedicated programs. One example of this is the separation of the screensaver settings and the power management settings in two independent configuration programs. As someone who has used quite a few GNU/Linux distributions so far I can’t not to notice the lack of certain options for the apparent purpose of making it more easy to use. Hence, the screensaver preferences program actually misses the test button that would allow the user to test the screensaver in addition to having a preview of it in a small window. How does this makes it easier to set up screensavers escapes me though, but as you’ll see later on this is not an unique example of the phenomenon known as “dumbing down” that Ubuntu apparently seems to employ. Even if you don’t find the included software set satisfactory, and sooner or later most people would indeed want more, you simply don’t have anything to worry about. Provided that you have an internet connection, a whole world of Free Software is at your fingertips. The Add/Remove menu item (of the applications menu) opens the doors for you by launching a program that allows you to surf through a nice selection of available programs that you can install from Ubuntu internet repositories. It is actually a front-end to synaptic (which is, of course, a front end to apt-get which is a front end to DPKG which is that mysterious underlining technology behind all this software installation magic in Debian based systems such as Ubuntu). This program only shows some of the major software packages available for install. If you want to see everything that is actually available you have to click on the “advanced” button which will open synaptic for you. Many have praised synaptic and I can only see why. There is no doubt that this is one of the best, if not the best package management front-end programs out there. You can browse through software by category or search them with a search box (also available from a ctrl-f shortcut) and then select software you want by clicking on a box next to it which will give you available options as to what to do with it depending on whether it is already installed or not. All the while the lower half of the window shows a description of the selected package that can help you decide whether to install or not. Even when you are not in Synaptic, Ubuntu will notify you if there are any software updates available by popping up a yellow box from a top panel. Nothing from the world of Windows matches this kind of software installation experience and I have doubts it ever will. Before concluding the software installation section I have one little nitpick to express regarding “dumbing down” mentioned earlier. Before updating software repositories configuration to include “universe” (easily done by selecting it in settings/repositories in synaptic) I have looked for XChat, a popular Internet Relay Chat applications. The Add/Remove program only offered XChat-GNOME, so I installed and tried that. 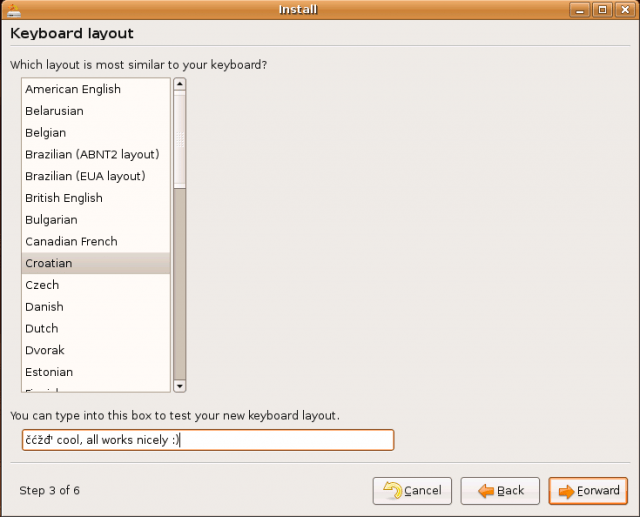 XChat-GNOME is quite frankly a “dumbed down” version of XChat which literary has some options removed for the sake of making it simpler or easier to use. Personally I don’t find it any easier and I never really saw the need for XChat in particular to be made any easier than it already is. I am therefore not sure if going through the effort of making a modified (dumbed down) version of XChat and including it as default XChat selectable from Add/Remove software program was really worth it. It is possible that a similar thing was done for some other software packages as well. However, a normal version of XChat is available in the universe repository, so there of course is a choice. It is already known that most of the basic hardware is well supported under practically all GNU/Linux distributions and my case wasn’t any different. The hardware support issue tends to pop up only in cases of graphics card drivers such as for NVidia and ATI or some other more exotic hardware. I have neither an NVidia nor ATI cards, but a built in onboard Savage graphics chip. While display and X started up normally I did have to go to the X configuration (/etc/X11/xorg.conf) to make a modification to my refresh rate and color depth setting to correct them. By default Ubuntu set them at more conservative values making my screen refresh rate quite low (60Hz) and depth at only 16bit. On a positive note, direct rendering seems to be enabled from the start which is a big improvement compared to previous releases and probably has much to thanks to the new Xorg 7 that is underneath. Some of the more exotic hardware that I have are the SkyStar2 DVB card by TechniSat and the USB EDGE modem produced by a Slovakian company zadaCOM. Living in a village with no availability of ADSL I connect to the internet using this EDGE modem (the EDGE wireless connection) and the DVB card for the one way (download) satellite connection. Using a proxy I redirect all download traffic over satellite which is faster and cheaper than EDGE. Good news is that both of these were properly detected by Ubuntu as shown by the “lspci” command and the device nodes were properly created in the /dev directory. All I needed to do to make them work was to copy the chat connection script and the proxy software directory to Ubuntu in appropriate places. It’s akin to installing a driver in windows, except that it is actually even faster and easier provided that you have these saved up somewhere. If I can get this working, then in most likelihood any of the major ADSL modems that most people use would work too. So for a great majority of people connecting to the internet with Ubuntu should not be a problem. So is the buzz around Ubuntu Dapper justified? There are a good deal of other great GNU/Linux distribution out there and many users have found a perfect match among them. To say that Ubuntu is the greatest and best of all would probably be a mistake. It is on everyone individually to decide what is best for them. However, as a distribution aimed at new GNU/Linux users, especially those coming from the world of Windows, Ubuntu appears to be leading the way and in my experience with its latest incarnation, justifiably so. The greatest strengths of Ubuntu Dapper are its new easy to use installer, the applications selection and how easy and fun it is to extend it with new software. What else can a computer user wish for than a free operating system that comes with a carefully preselected selection of applications for some of the most common needs of a desktop user and allows such an easy way to add even more to it. You have, almost literary, a whole universe of Free Software at your fingertips, practically just a click away. Dapper also comes with a great new look which in no way lacks behind Windows Vista and Mac OS X, while changing the looks to what you want is as easy as anything, not to mention the magic of XGL that is available to those with good graphics card. Ubuntu is out there on the borders between the GNU/Linux territory and the Windows territory and I believe it is and will continue to be successful at converting an ever larger number of Windows users into happy GNU/Linux users. Just look at the blogs they’ve been writing. 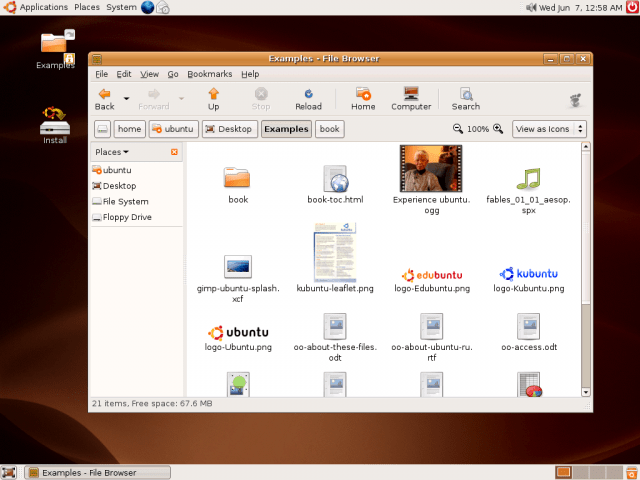 It is indeed a good choice to get nuxified with Ubuntu Dapper 6.06!